Today, the Federal Trade Commission, jointly with the offices of eight state Attorneys General, the New York Division of the U.S. Postal Inspection Service, two U.S. Attorneys’ Offices and the Better Business Bureau (BBB), announced the results of Operation Main Street: Stopping Small Business Scams, a law enforcement initiative targeting operations seeking to defraud small businesses, and an education outreach effort to help small businesses protect themselves from fraud. The agencies are announcing a total of 24 actions involving defendants who allegedly perpetrated scams against small businesses, including one new FTC case, three other FTC actions from the past six months, two criminal actions announced by U.S. Attorneys’ Offices and 18 actions by state AGs over the past year. The BBB is announcing a new research report on small business scams that provides substantial new insights into how fraud affects small businesses. In addition, the FTC and the BBB are pleased to announce new business education materials, designed to help small business owners and their employees avoid, identify and report scams. “The role of the state attorney general is not to second guess lawful business decisions. But when someone scams or defrauds a business, they should be held accountable. In doing so, we create an environment where all legitimate business owners can thrive,” said Arizona Attorney General Mark Brnovich. In Premium Business Pages, the FTC charged nine individual and corporate defendants based in Canada and the United States with operating a common enterprise that, since at least 2013, has made unsolicited calls to small businesses and other organizations to induce them to pay for unordered Internet directory listings, search engine optimization services or website design and hosting services. The defendants allegedly targeted consumers using various different business names, including Premium Business Pages, Ameteck Group, The Local Business Pages and Data Net Technologies. According to the FTC, when contacting consumers for the first time, the defendants claim to be calling to collect on a past-due invoice for one of the defendants’ services. In reality, the consumers – who are often small businesses – never ordered or agreed to buy anything from the defendants and were not previously sent an invoice. In many cases, the defendants’ telemarketers threaten that if the invoice is not paid promptly, the consumers’ accounts will be turned over to “collections” or will be “red flagged.” Some consumers are also told that their credit will be negatively affected. The complaint alleges that to induce consumers to pay immediately, the defendants’ telemarketers sometimes offer “discounts” on the supposedly outstanding amount, or offer to “waive” additional fees and costs. If consumers accept and agree to pay the lower amount, they are told they must pay promptly, usually within 24 hours. In many cases, even after receiving fake invoices, consumers refuse to pay. The defendants then take additional steps to coerce them into paying, including by making repeated calls demanding payment. The FTC alleges that in some cases, even after a consumer has paid money they did not owe, the defendants call back weeks later, sometimes claiming to be a different company demanding payment for other “outstanding invoices,” or claiming that the consumer’s first payment was only the first installment. As a result, many consumers have paid hundreds or even thousands of dollars for services they never ordered and did not want. The Commission vote approving the complaint against Premium Business Pages was 5-0. The complaint was filed in the U.S. District Court for the Northern District of Illinois, Eastern Division on June 13, 2018, and the judge has granted the FTC’s request for a temporary restraining order against the defendants. The FTC acknowledges the assistance of the Canada Competition Bureau in the case against Premium Business Pages, as well as the Better Business Bureau of Louisville, Western Kentucky & Southern Indiana, the Better Business Bureau of Los Angeles and Silicon Valley, and the Better Business Bureau of Chicago and Northern Illinois. PointBreak Media, filed in May 2018, in which the FTC charged a Florida-based scheme with deceiving small business owners by robocalling small businesses claiming to represent Google, falsely threatening them with removal from Google search results, and falsely promising first-place or first-page placement in Google search results. DOT Authority, settled in March 2018, in which the operators of a registration service for motor carriers settled FTC charges that they impersonated, or falsely claimed affiliation with, the U.S. Department of Transportation and other government agencies to get small trucking businesses to pay them for federal and state motor carrier registrations. In connection with the settlement, the defendants agreed to injunctive relief and paid $900,000, which will be used to fund consumer redress. A-1 Janitorial, announced in November 2017, in which at the FTC’s request, a federal court temporarily halted a New York-based office supply scheme that charged small businesses and non-profit organizations millions of dollars for “free” samples of cleaning and other products. Through 18 actions announced today, eight state Attorneys General, two U.S. Attorneys’ Offices, and the U.S. Postal Inspection Service, New York Division, contributed to the success of Operation Main Street. The FTC has a long history of working with other law enforcers at all levels of government on appropriate cases. scams involving fake invoices sent to small businesses, in which the defendants try to coerce the companies into paying for products they never received. Also today, the BBB issued its “Scams and Your Small Business Research Report.” The report, which is available on the BBB’s website and in hard copy, is designed to educate and empower small businesses to speak up and report fraud, enabling the BBB to expand its knowledge of how scams uniquely impact these consumers. The report is based on results from a new survey that was conducted in March 2018 by six local BBBs. It contains information from approximately 1,200 small businesses nationwide. 67 percent of the respondents surveyed believe there is a growing risk of scammers targeting small businesses, with only three percent believing that the risk has decreased over the past three years. The top five scams identified as putting small businesses at risk are: 1) bank/credit card company imposters; 2) directory listing and advertising services; 3) fake invoices/supplier bills; 4) fake checks; and 5) tech support scams. 38 percent of respondents believe that hearing generally about a particular type of scam is the best way to proactively protect their business, followed by 35 percent who think the best way is to have generally heard about the methods and behaviors of scammers. The primary motivations for small businesses to report scams included helping to warn others about the scams, trying to bring justice to the scammer and trying to recover money lost through the scam. 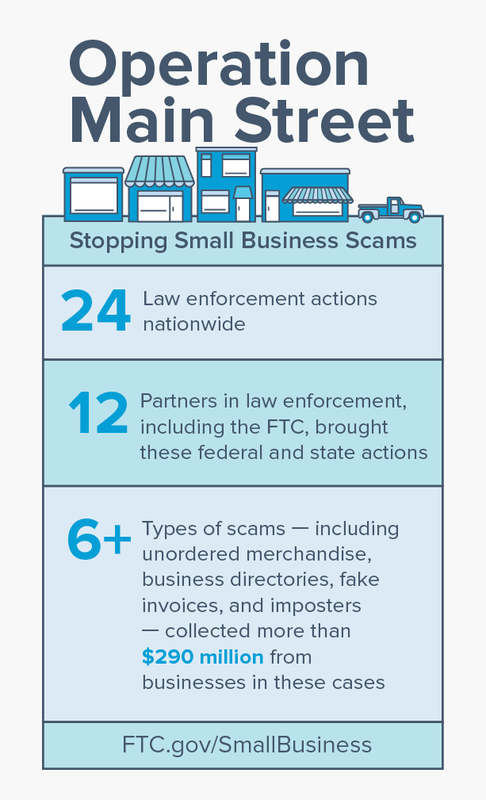 Finally, as an important component of Operation Main Street, the FTC and BBB today issued co-branded materials that are available on their respective websites to help small businesses identify and avoid potential scams. “Scams and Your Small Business” is available in both English and Spanish, and includes information on scammers’ tactics, how small businesses can protect themselves from scams, common scams that target small businesses, how to report a scam and related resources. The FTC and BBB would like to thank the AGs from the following states for their invaluable law enforcement contributions to Operation Main Street: 1) Arizona, 2) Delaware, 3) Florida, 4) Indiana, 5) Missouri, 6) New York, 7) Tennessee and 8) Texas. The FTC and BBB also appreciate the assistance of the U.S. Attorney’s Office for the District of Maryland, the U.S. Attorney’s Office for the Southern District of New York and the New York Division of the U.S. Postal Inspection Service. The FTC also appreciates the help of the following federal, state and local partners in publicizing the initiative and promoting the consumer education information: The U.S. Small Business Administration, the Attorneys General Offices of Colorado, Nebraska, Nevada, Pennsylvania and Utah, and the Fresno County Office of the District Attorney. For more than 100 years, the Better Business Bureau has been helping people find businesses, brands, and charities they can trust. In 2017, people turned to BBB more than 160 million times for BBB Business Profiles on more than 5.2 million businesses and Charity Reports on 11,000 charities, all available for free at bbb.org. The Council of Better Business Bureaus is the umbrella organization for the local, independent BBBs in the U.S, Canada, and Mexico, as well as home to its national and international programs on dispute resolution, advertising review, and industry self-regulation.